CASA CLAUDIA has two double bedrooms and a large living room with kitchen area, separated from the living room by a large archway. You can have lunch in the large table and appreciate the warmth of the fireplace in the winter months. During the summer season it is certainly more pleasant to eat under the panoramic porch, overlooking the farmyard or in the farmyard itself, to fully enjoy the view of the countryside and Pienza. Two large apartments for 4 people each. 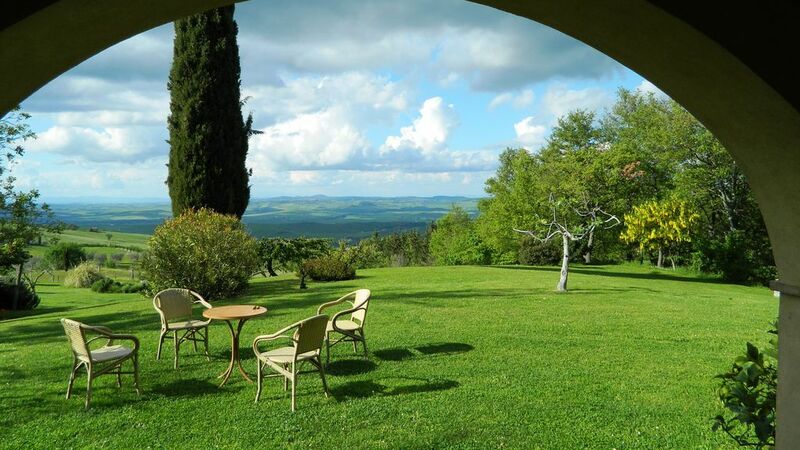 The farm 'The Rogheta', 1 km from the village of Campiglia D'Orcia, in the province of Siena, is in a hilly location and overlooks a large and beautiful landscape. We are in-Natural-Artistic Park of the Val d'Orcia, declared in 2004 by UNESCO World Heritage Site. Our farm is an old renovated farm, near the Via Francigena, which in the Middle Ages was traveled by the many Pilgrims who went to Rome. It consists of a main building and two outbuildings, surrounded by olive groves, wheat fields and some vineyards. The main house has two apartments (Casa Claudia and Casa Letizia on the ground floor to the first floor) with separate entrances, for a total of 8 beds and the use of the kitchen. And 'therefore particularly suitable for two families who want to stay close, but maintain their autonomy. The Hague-garden full of bushes, flowers and trees, look at the vast panorama where the background emerges Pienza, jewel of the Renaissance. The structure is surrounded by its own fields, of which 7 hectares classified as arable and 3 hectares are planted with olive trees. It has a landscape of indescribable beauty, a fresco of the Tuscan landscape that combines the art and the culture of renowned centers such as Pienza, Montepulciano, Montalcino, San Quirico d'Orcia with the beauties of thermal zones as Bagno Vignoni and S. BATHROOMS FILIPPO. Even the sea is not far away: in about an hour you are at Alberese on the coast of the protected park of the Uccellina, near Grosseto. In less than an hour you can reach the LAKE of BOLSENA and the Etruscan cities of Pitigliano, Sorano and Sovana. Good. Welcome and friendly. Very helpful. Our guests were very kind and interested in learning about our area. Amazing views, Lovely warm welcome, would recommend. Lovely location, we were made to feel very welcome. An amazing peaceful place to just chill or go for a wander around the olive trees. Thoroughly enjoyed our week here. We are very happy that Paul and his family were fine and enjoyed our stay with us. The hosts, the view, the wine, the home were spectacular. We took a train to Chiui, rented a car, drove to Rogheta and were greeted by Letizia. The home was very clean and does have Wi-Fi. It is central to many wineries and beautiful hill towns, everything we were expecting of a visit to Tuscany. Thanks to George and Marilyn for the nice words. We are happy that they have been well with us and have appreciated our home and also what the surrounding area offers. Travelling alone at Le Roghete I met very special people, the landlords. Very friendly, very supportive, sympathetic, I could spend the rest of this space taking about them. I stayed at one of the appartments for 21 days, and I left with the feeling that it wasn´t enough, that I should return soon. The place is very well kept by Letizia and Giorgio, very proper, confortable king size beds, good shower, very confortable and spacious place. Its location is supperb and I drove back and forth trough all Tuscuny- beautiful Tuscuny. In an Agriturism address but near everything. The surrounding villages/cities restaurants provided all the exquisite flavours I was looking for. I came home with the feeling ...I want more of it. Ci ha fatto veramente piacere leggere le belle espressioni che descrivono la casa e il territorio della nostra Toscana, ma soprattutto ci hanno colpito le belle parole usate nei nostri confronti. La cosa più importante è sapere che un ospite si è sentito bene accolto e a proprio agio nella nostra casa. Con persone sensibili come lei, d'altra parte, non è difficile trovare subito una buona intesa e la voglia di stare insieme. Grazie davvero, di cuore !!! Wir waren im Oktober für zwei Wochen in der Wohnung Casa Claudia und haben viele wunderbare Eindrücke mit nach Hause genommen. Am meisten in Erinnerung geblieben ist uns die Gastfreundlichkeit der beiden Vermieter, Letizia und Giorgio, die uns gleich am ersten Abend empfangen und uns alles gezeigt haben. Sie waren immer zur Stelle, wenn es Fragen gab, oder auch einfach, um sich kurz auf der Terrasse zu unterhalten. Die Sprache war dabei kaum ein Problem, dank moderner Technik und anderem. Wir schlossen die beiden von Anfang an ins Herz. Als nächstes erscheint vor meinem inneren Auge die wunderschöne Landschaft und der atemberaubende Ausblick von der Terrasse sowie das riesige, tolle Grundstück. Man mochte den Blick gar nicht von all dem abwenden, so schön war es. Direkt von der Terrasse der Casa Claudia aus hat man einen großartigen, kilometerweiten Blick über das Tal, das Val d’Orcia. Der große Olivenhain lud immer wieder zu kleinen Spaziergängen ein, ich konnte gar nicht genug den Blick über das wunderschöne Land schweifen lassen. Auch die Landschaft des Val d’Orcia hat „einen Daumen hoch“ verdient. Auf vielen Erkundungstouren gab es jede Menge zu entdecken. Im Oktober ist dieses Tal wirklich einen Besuch wert. Ebenso gibt es einige kleine Städte, die einem das typisch italienische Flair näher bringen. Vor allem die Stadt Pienza ist immer einen Besuch wert, wir waren ganze dreimal dort; mit dem Auto ist Pienza gut zu erreichen. Alles in allem war unser Urlaub auf Le Rogheta ein unvergessliches Erlebnis. Noch einmal möchten wir uns ganz besonders bei Letizia und Giorgio bedanken. Sie haben unseren Urlaub nicht zuletzt zu dem gemacht was er war. Wir konnten einen Traumurlaub in der Toskana genießen. Abbiamo subito capito che Peter e la sua famiglia sono persone dinamiche e desiderose di conoscere. Subito hanno dimostrato di apprezzare le cose belle dei paesaggi e dei centri d'arte ma anche quelle più intime della campagna, come ad esempio il calore fisico e psicologico della fiamma del caminetto o il gusto rotondo di un buon bicchiere di vino rosso! The reference country is Campiglia d'Orcia, small and ancient country that seems frozen in time. Here you can find the essential services: small food shops, the bank, the post office, the doctor. Abbadia S. Salvatore (13 Km.) Is the Hospital. All places in the area offer opportunities for recreation, culture and gastronomic tourism. In Montalcino you can taste one of the finest wines, Brunello and Montepulciano Nobile! You will also find shops and taverns to taste the famous Chianina meat or cheese pecorino cheese! There are also beautiful churches or Abazia, imposing villas or bushes and of course monuments and medieval and Renaissance cities. Do not miss a dip in the warm, sulphurous waters of Bagno Vignoni or a refreshing bath in "pools" of Fosso di Bagni S. White Filippo.